Wigtown & Bladnoch v Mid Annandale' Matthew Robertson (number 12) is fouled to give Wigtown a penalty. 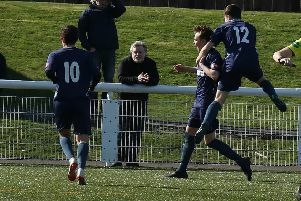 Third travelled to first on Saturday as Trammondford Park saw its second big clash in just four days. Mid Annandale, who had been the early pace setters, came out of the blocks very well against Wigtown as they saw a great chance go just wide early on before Wigtown keeper Martyn Roddie made two quick saves. Wigtown had to build from the back and they did as they attacked up the right wing but Mids cleared the cross. The first half continued and as time went on, the half became more of a midfield battle. The second half saw Wigtown starting better, before a quick counter attack found Reece Agnew, who slotted home on the hour mark. Just two minutes later, and the hosts doubled their lead with a great cross finding Robert Jamieson, whose looping header found the net. On 68 minutes, Matthew Robertson picked the ball up on the left before driving to box. This run caused the Mid Annandale goalie to have to come off his line and make a challenge resulting in referee, Billy Dewar-Riddick, immediately pointing to the spot before handing the goalie a yellow card. Up stepped Ian Miller and the midfielder hammered the ball into the right of the net, sending the keeper the wrong way. 12 minutes later and Miller had doubled his tally for day as he was found by a delightful cross which he duly headed home. As the clock hit 90 minutes, the visitors gained a consolation as Connor Murray broke forward before putting the ball over Wigtown goalkeeper Martyn Roddie and into the net. A great result against a very tough side to put Wigtown seven points clear at the top of the table.